This is a Mudcrab. 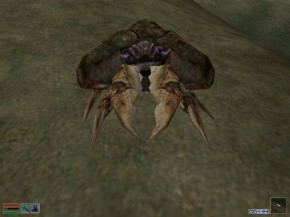 This particular fellow inhabits the game Morrowind, but you can find Mudcrabs in all of the games in the Elder Scrolls series. In fact, they're an extremely common creature in that world. But this isn't just any Mudcrab. This Mudcrab is in fact the richest merchant in the world of Morrowind. There is literally nothing that distinguishes him from any other Mudcrab in the game and the first time you see the phrase "Talk to Mudcrab" pop up on your screen it's a surreal moment. You ask yourself, "Is it a bug? A weird little glitch? Whatever LETS TALK TO HIM!" Finally that moment he responds to you for the first time just feels special. I've talked to a lot of people who have played Morrowind and probably 90% of them never found this little guy. But really why should they? I miss moments like this in games. They're often few and far in between but the times when you do find them are absolutely memorable. I had another moment like this playing The Witcher 3 just last night. The first thing that needs to be said is that I've been playing this game a while now so I'm getting to be a fairly high level. 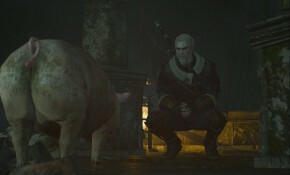 I've killed monsters great and small, won friends and lovers, and found no shortage of enemies all across the land... Now here I am chatting with a pig. I found out later that this is actually a DLC quest that they added to the game later. So this isn't one of those things like the Mudcrab in Morrowind where most players haven't done it. Yet what struck me about it, was that this is a level 6ish quest and in most games doing a level 6 quest as a high level character is a pretty dull affair. Level 6 monsters at this point practically see me and then just kill themselves to save me the trouble. However, when I played through this quest I found myself still having fun. It was the weirdness of the whole quest that made it all worth it and memorable. Yet even among all of this strangeness there is a still a very real element to all of it and brings the player seamlessly back where they were in the world of the Witcher. I'd rather not spoil the quest for those who haven't played it but rest assured that at the end of the day people are still people. CD Projekt RED in particular I've found are rather good at this sort of thing. To me these are one of those little things you should strive for in a game. Just these little moments of strange but wonderful that really makes the game feel more alive. They need to be handled with some caution but with the right treatment they will change the entire experience of the game for the better.